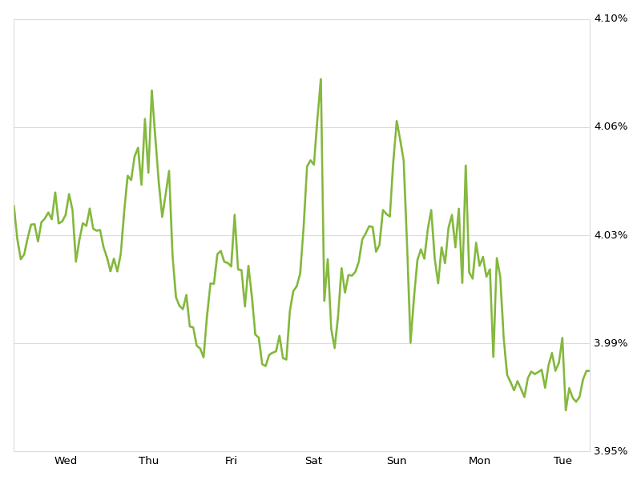 Zillow*The weekly mortgage rate chart illustrates the average 30-year fixed interest in six-hour intervals. Mortgage rates for 30-year fixed mortgages fell this week, with the current rate borrowers were quoted on Zillow Mortgages at 3.97 percent, down from 4.05 percent at this same time last week. The 30-year fixed mortgage rate hovered between 3.96 and 4.08 percent for the majority of the week before settling at the current rate on Tuesday. "Rates dropped below 4 percent on Thursday amid the uncertainty and turmoil following the MH17 flight disaster and ongoing military activity in the Middle East," said Erin Lantz, vice president of mortgages at Zillow. "This week, despite a fair amount of domestic economic data slated for release, we expect events in the Middle East and Ukraine will continue to put a damper on rates." Additionally, the 15-year fixed mortgage rate this morning was 3.01 percent, and for 5/1 ARMs, the rate was 2.77 percent. Purchase Mortgage Application Activity: Zillow predicts tomorrow's seasonally adjusted Mortgage Bankers Association Weekly Application Index will show purchase loan activity to increase by 4 percent from the week prior. To learn more about this Zillow analysis, click here.